The Colony of Pelican Landing, a master-planned resort community can be found in the beautiful Bonita Springs of Southwest Florida. With a little over 2,365 acres of incredible residential options, you are certain to find a home for sale that meets all of your needs and expectations. A few of the subdivisions that contain Pelican Landing condos include: Castella, Costa Del Sol, Cottages, Creekside Crossing, Cypress Island, Florencia, Lakemont Cove, La Scala, Merano, Mystic Ridge, Navona, Palermo, Palm Colony, Pointe, Reserve, Sandpiper Isle, Sawgrass Pointe, Southbridge, and The Tides, and Treviso. Pelican Landing high rise and low rise condominiums boast breathtaking views, some of the beach, some the gulf, some of golf courses, some of nature preserves. Real estate in Pelican Landing comes in varying price points and sizes with condos ranging from 1,000 square feet to over 7,000 square feet. With condo prices starting around $85,000 and reaching as high as $4 million, Pelican Landing truly offers something for everyone. Custom estate homes can have up to 8,000 square feet of living space, with pricing similar to that of the luxurious condos. Other home options include coach homes and villas. Residents of Pelican Landing enjoy a number of amenities that elevate their lifestyles to one of leisure and luxury. These conveniences include nature trails for walking, jogging and biking, a 34 acre private beach park, a butterfly garden, a 15,000 square foot community center and much more. Additional amenities that are sure to delight potential home buyers include championship golf courses, a canoe/kayak park, lagoon style swimming pools, a 3,200 square foot fitness center, 12 lighted tennis courts, a sailing center and boardwalk. This prestigious community is diverse and welcoming to all who would like to call this beautiful place home. 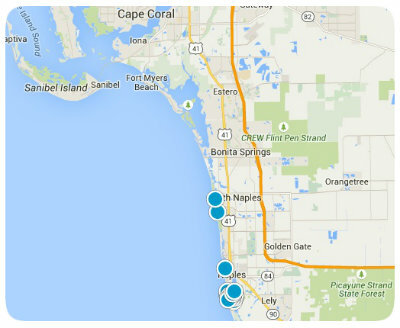 Pelican Landing, being located in Lee County, Florida is near Spring Creek and Estero Bay. Residents of Pelican Landing have the option of purchasing membership in Pelican Nest for a golf membership or the Pelican Isle Yacht Club. They also enjoy casual and formal dining options. Buy a home in Pelican Landing and you too will love all the amenities contained within its gorgeous tree-lined streets, tucked safely behind 3 guard gates. If you are interested in buying a home in the luxurious and exclusive Pelican Landing, or have other real estate questions, please contact us today for more information.